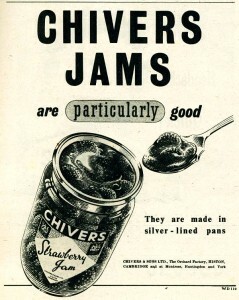 Chivers was the first large British firm to locate a jam factory within a fruit orchard. 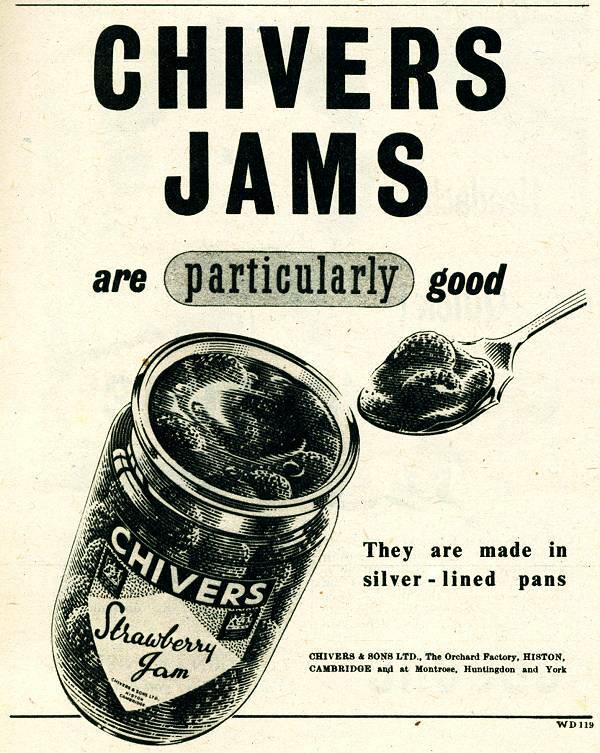 Chivers was one of the largest jam manufacturers in Britain by the early twentieth century. Stephen Chivers acquired a small freehold farm in Histon, Cambridgeshire in 1806. His son, John, had served an apprenticeship to a fruit grower, and began to cultivate fruit on the estate. However the journey to market in London took fifty hours. Fruit was also sold at a depot in Bradford, Yorkshire. There it was discovered that much of their crop was being purchased by jam-makers. The family decided to cut out the middleman, and manufacture jam for themselves. John’s son Stephen (1824 – 1907) made jam in a small barn on the family estate from 1873. The recipe came from a relative who was a chef at Pembroke College, Cambridge. Two years later a factory was built on land adjoining the village railway station. The factory had doubled in size by 1889. The firm competed on quality rather than on price. Marmalade, custard powder and table jellies were produced from the 1880s. Lemon curd and custard powder had been added to production by the end of the century, allowing for year round employment of staff. Inspired by their strong Baptist faith, the Chivers family had a paternalistic attitude towards their staff, and employee-worker relations were good. The firm began to can English fruits from 1894. By this year the company had over 400 regular employees, bolstered by seasonal workers during peak times. Chivers enjoyed nationwide distribution by 1900, and was the largest jam manufacturer in Britain to grow the fruit itself. The firm was incorporated in 1901. 1,200 tons of strawberry and raspberry jam were produced in 1906. Olde English thick cut marmalade was introduced from 1907. A new fruit canning factory was erected in 1907. Over 1,000 workers were regularly employed by the firm by 1907, with hundreds more hired during the fruit season. During peak times, 100 tons of jam were produced daily. Chivers was converted into a public company in 1913. The company had an output of up to 20,000 tons of jam per year by 1921. During the busy season between 2,000 and 3,000 workers were employed. Much of the machinery in the factory was built by Chivers engineers. One machine was able to fill 80,000 tins per day. A raspberry canning factory was opened in Montrose, Scotland in 1925. The Chivers farm extended to over 5,000 acres by 1925, of which 1,500 which given over to orchards. A vegetable canning factory was established in Huntingdon in 1930. The Chivers estate covered 6,000 acres by 1931. The company employed 3,000 people by 1935. Chivers was the largest canner of fruits and vegetables in England by 1938. About 4,500 people were employed across four factories. The farms had been extended to 7,000 acres, with 3,000 given over to fruit. Between four and five tons of marmalade were produced each year. Chivers lost its market leading position after 1945, due to a failure to install modern equipment. All of the ordinary shares were held by descendants of the Chivers family until 1952. The company had an authorised share capital of £1.5 million in 1952. There was a large export trade, particularly to the United States and Canada. 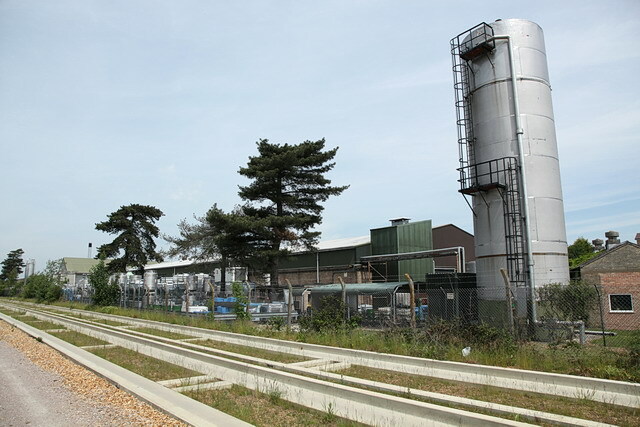 Factories at Histon, Huntingdonshire and Montrose in Scotland covered a total of 2.5 million square feet. Freehold farms covered 8,000 acres, and leasehold covered 1,000 acres. There were also manufacturing facilities at York and Wisbech, and Newry in Northern Ireland. The management comprised of members of the Chivers family. There were around 4,000 employees. Chivers was acquired by Schweppes, the British soft drink manufacturer, in 1959. It was a friendly takeover, approved by the Chivers board of directors, all of whom were family members, and owned the majority of the shares. Schweppes merged the company with other large sweet spreads manufacturers: Hartley’s, Rose’s and Moorhouse, but concentrated production at Histon. Schweppes was able to provide much needed capital and introduced modern management techniques. The Chivers family bought back the farming estates from Schweppes in 1962. The Huntingdon factory closed was in 1966. The Chivers brand was withdrawn in Britain from 2004, with all products rebranded under the Hartley’s name. Chivers Olde English is produced in the United States under licence, and Chivers products are still produced in Ireland by an independent company.